Amy Brown's artwork comes to life with this fabulous figurine! The statue features a beautiful pixie lady. 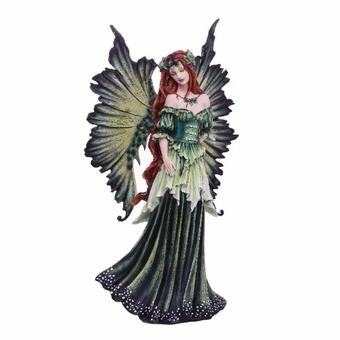 She is clad in shades of green, with an impressive set of wings to match. Her red-brown hair stands out against the springy hues, and she has ivy leaves accenting her tresses and neck. A lovely way to bring some magic into your home! Size: 10 1/2" x 6 1/2" x 19 1/4"